To celebrate the launch of Blade Strangers for Nintendo Switch, Nicalis has put out a launch trailer for the game. Blade Strangers is now available at retail and Nintendo eShop for USD39.99. 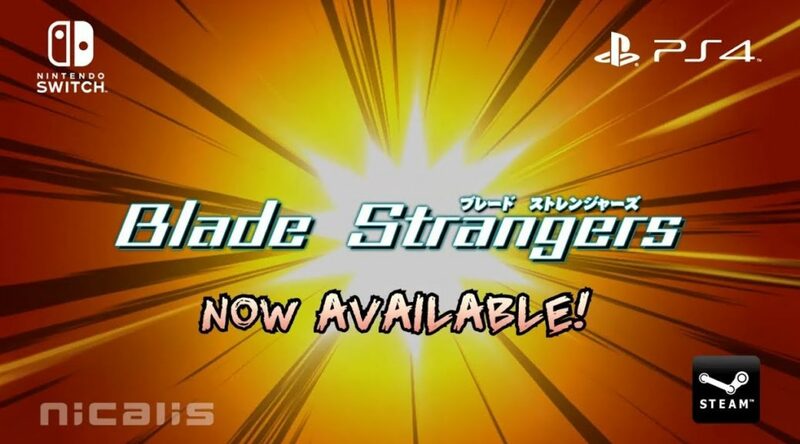 Nicalis, Inc. today announced that Blade Strangers, the all-new crossover fighter, arrives digitally and physically in stores beginning today on Nintendo SwitchTM, PlayStation®4 and Steam (digital only). Old school meets new school when the excitement and subtle dynamics of a classic one-on-one fighting game are combined with the polish and high-quality visuals expected from a current-gen contender. Blade Strangers embraces a traditional and streamlined four-button control scheme that offers accessible inputs for new players, while still providing advanced players with endless opportunities to discover new tactics as they hone their skills. The new challenger in the fighting-game arena delivers tons of action-packed content, complete with a wide variety of gameplay modes and offerings including offline Story, Arcade, Versus, Challenge and Survival modes in addition to a host of online modes, leaderboards and extra features. The diverse roster in Blade Strangers includes unique characters from different backgrounds, headlined by Quote and Curly Brace (from Cave Story+), Isaac (from The Binding of Isaac: Afterbirth+), Solange, Ali, Liongate and Master T (from Code of Princess EX) and Kawase, Noko and Emiko (from the Umihara Kawase series). The 14-character launch roster also features video game superstars Shovel Knight and Gunvolt as special guests, plus the debut of new characters Lina and Helen. Developed in Japan by Studio Saizensen and produced and published by Nicalis, Blade Strangers is rated “T for Teen” by the ESRB and is available digitally and physically beginning today for Nintendo Switch and PlayStation 4 and digitally for the Steam platform for $39.99 MSRP. For a limited time, launch copies of the physical versions will include reversible box art, an instruction booklet and one of two different PVC character straps (Solange or Kawase) inside the package.